I don’t like “New Years Resolutions.” It sounds nice, but it feels too squishy. It lets you off the hook if you don’t succeed simply because you tried. Instead, I’m a big fan of New Years Goals. A well constructed goal features steps required to achieve it, and it keeps you accountable. It doesn’t sound as attractive as a resolution, but direct wording rarely does. With this in mind, I’d like to share with you our goals for the new year! 1. Complete the Alpha Build – This is the first thing on our To-Do list for the year. The sooner we can get a comfortable build out and ready for you to play with, the better! We’re going to be releasing a statement on the specifics of this build soon, but allow me to share a little bit with you now. For those of you that don’t know, “Alpha” is a fairly nebulous term. It gets even more nebulous when I tell you that, really, this build is a Pre-Alpha. This means that while many of the major mechanics are in the build, but very few of them (if any) are complete. Also, beyond that, the experience will be very limited, which is usual for Alphas. Again, we’ll be explaining our Alpha very soon. 2. Complete the Demo Build – Up until this point, we’ve been constructing mechanics and working on the visuals of the game. This is primarily what you’ll be seeing in the aforementioned Alpha Build. In our later Demo Build, we plan to have constructed an environment that allows for you to accomplish tasks that re-contextualize your actions in a way that creates a meaningful interaction between player and game. This is developer-speak for Story, which we currently have written down and nearly prepared for implementation! (Some fine-tuning required, as always) Our goal is to have this accomplished by the end of April! 3. 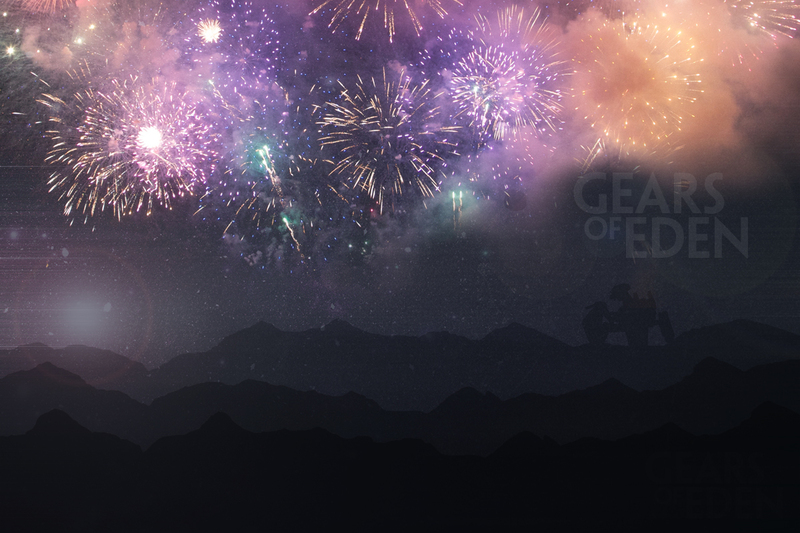 Complete the story of Gears of Eden – Up until this point, we haven’t wanted to focus on too much beyond our Demo. We have some rather fleshed out world-building tucked away and we have the story for the demo, but beyond that? A blank canvas, ready to be filled in with something beautiful! That is my job. Well not just mine; no doubt it will be as collaborative as any other part of indie game development, but it is my responsibility. Among other writing goals, I plan on completing the story before the end of the year. I better get working on that soon though, because I have all the faith that our wonderful team is going to be nipping at my heels! We want to do more this year, that’s a given, but the completion of the demo is the foremost challenge on our minds, and to think too far beyond that might get daunting. Besides, content creation is a whole world of development of its own! That’s going to be a very fun journey, so be sure to stick around and share in that experience with us! We deliver updates every week, so follow us on Twitter or Facebook for the latest updates! If you’re so inclined, you can also sign up for our newsletter, which automatically enters you into the drawing for a key to the alpha! Until next time though, this has been your weekly Dev Update. See you next week!